Whenever I walk by this car that’s often parked on my street I chuckle at the ensuing discussion in my head between the inner cynic and the eternal dreamer. There are days when the cynic wins, heckling me with stereotypes of just another Volvo-driving, Birkenstock-clad idealist, engaged in a lost cause and trying to get some cheap attention. It’s usually the kind of day when my mind is already fragile and tender, shaken by everything from streams of bad news from around the world to frustrations with my own inability to be more kind and patient in this fast-paced world we live in. But then the feeling travels deeper, and I am touched by the radical beauty spilling from this unprompted disturbance of my muggle state of mind. Here I am, going about my everyday business, all channels set to “routine,” and all of a sudden there’s a big smile on my face. What would have just been another oblivious trip to “some place else” turns into a magical moment of appreciation for what’s right here and now. For just this moment I am wholly present, knowing fully well that the only place love can be experienced is right here and now. I can make plans to be more loving, but that’s not a state of more loving — it’s a state of making plans to be more loving. And such is life itself, an invitation to be fully engaged in every moment — especially those moments deemed irrelevant by our muggle mind. Which, is to say, most of them. It’s in our nature to continuously be going somewhere, but during my more lucid moments I notice that we have a tendency to be disproportionately more focused on the Somewhere rather than the Going. John Lennon said it pretty well when he sang, “Life is what happens to you while you’re busy making other plans.” And so it is with love as well — we spend so much of our time searching for the right situation to love that we forget the only place we can be loving is right here and now. And with astonishing frequency in many of our urban lives, that place happens to be a crosswalk. 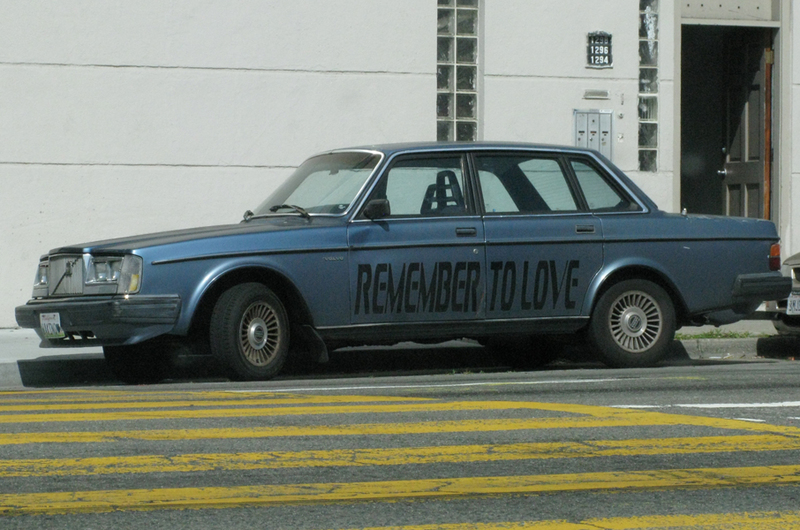 So I take a deep bow to the Volvo-driving, Birkenstock-clad idealist for reminding me of the oft-unseen spaces between, brimming with love and magic. Or, then again maybe not. Thanks, Sven, for the usual insightful words. I love this (no pun intended, or well, maybe)! I especially love this line: “I can make plans to be more loving, but that’s not a state of more loving — it’s a state of making plans to be more loving.” Majorly insightful. I also love how you repeated the Rumi lines three times. I often do that when I am reading poetry aloud to groups because it gets beyond the superficial “hearing” and into real listening.